In this blog post we look at a recent squash court heating installation at a court in the South East of England. The installation was carried out by our friends at Cost Effect Heating who kindly supplied us with on site updates and images of the completed project. The committee at the squash club wanted to upgrade their existing inefficient heating system with something more energy efficient and less agricultural looking. 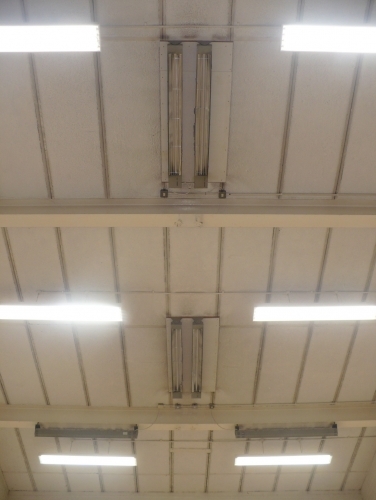 Their current squash court heating system consisted of six 3kW quartz halogen heaters per court. The total load for the two courts was a whopping 36.0kW! 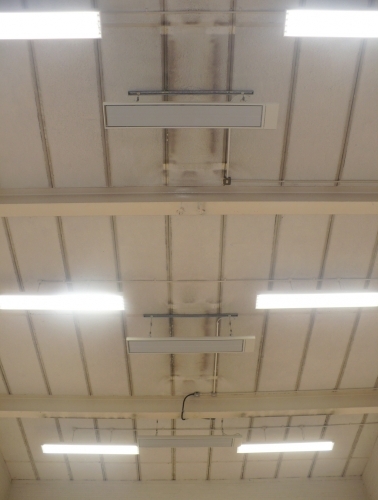 The committee were also interested in the fact that the new heaters proposed for the installation didn’t give off any light as the orange glare off the old quartz heaters was distracting to its squash players. After carrying out a site visit and liaising with our designers, the team at Cost Effective Heating proposed installing 3 x 2.4kW longwave radiant heaters per court controlled via a thermostat. Straight off the bat they were able to drop the overall load from 36.0Kw to 14.4kW which means the squash club would be using over 50% less energy per court! The room thermostat would also keep each court from exceeding a pre-set ambient temperature making it comfortable for its members to play a game of squash whilst also keeping the running costs to a minimum. The radiant cassette heaters themselves are ideal for squash court heating as they can be mounted up out the way and give off no noise or light output. The heaters have a very smart, clean, compact design and are not noticeable once installed – please see installed photo to the right. 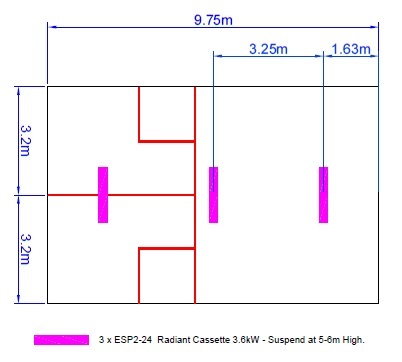 Here is a link to our longwave radiant cassette product page. We would like to say thanks to Chris at Cost Effective Heating for all his help on this project and for supplying photos of his hard work! BN Thermic has vast experience designing heating schemes for a range of leisure applications including gymnasiums, squash courts, changing rooms and sports halls. If you have any questions or require a quote please contact us on 01293 547 361.